'VHS Lives' is back, with VOL 2: UNDEAD FORMAT. VOL.1 (DETAILS HERE) was released not that long ago and became on of SRS Cinema's fastest selling VHS releases. So naturally given the popularity of the documentary, a second volume only made sense! 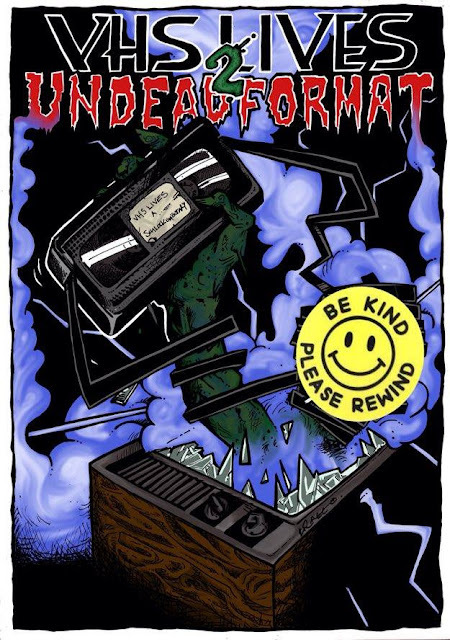 Directed and produced by Tony Newton “VHS Lives: A Schlockumentary”, “Trashsploitation” and “Grindsploitation film series”. If you thought VHS was dead then think again this format is not being buried or forgotten anytime soon! This VHS documentary delves deep into the world of VHS collecting and VHS memories, as we uncover just why VHS is so popular and what VHS titles are worth a small fortune! Featuring insights from cult filmmakers and underground horror and SOV filmmakers including: Tim Ritter, Paul M McAlarney, Dustin Ferguson, Scarlet Fry, Richard Mogg and Josh Schafer. Presales are live now and as with volume 1 is limited to just 30 units. Copies are expected to start shipping mid to late October.